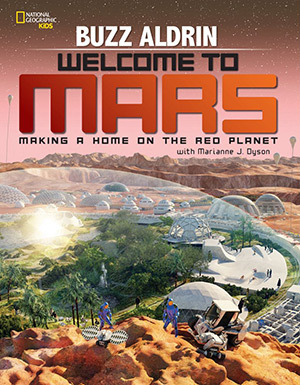 When you combine the talents of a brainy Apollo astronaut and an award-winning children’s author and former NASA flight controller, you get Welcome to Mars: Making a Home on the Red Planet, a high-quality, thoughtful, and clearly written book that encourages young people to build a settlement on the planet Mars. A couple of disclosures up front: Marianne Dyson is a friend and editor of mine. Like many NSS members, I know both Dyson and Aldrin from when Buzz was Chairman of the Board and Dyson was a VP/director/ISDC® chairman. Buzz is now on the NSS Board of Governors and Dyson is on the Board of Advisors and a frequent contributor to Ad Astra. And yes, I’ve met Buzz several times. I’ve also got a self-interested motive for reviewing this book: I want my nine-year-old nephew Connor—who’s already got a bit of the “space bug”—to continue pursuing that interest. I am the target buyer: an older space advocate looking to give this book to its target audience, young people ages 8-12. That said, this is a good book for adults, too; I enjoyed reading it. Welcome to Mars is written in a series of two-page articles covering a wide variety of topics, the latter to be expected in a book discussing the complexity of building a settlement on Mars. The book is addressed to “you,” the reader, who will participate in building the settlement. The two-page format is good for impatient or time-constrained readers who might only be able to absorb a couple of pages at a time. Aldrin and Dyson manage to pack a lot of information into each section, touching on everything from the history of Mars orbiters and landers to the cost of launching things into space, to a favorite proposal of Aldrin’s: the “Mars cycler.” The early pages lay the intellectual groundwork for getting the reader thinking about Mars by moving from what is known to what still needs to be done to make traveling to Mars a reality. The book also includes a glossary and list of further reading. The contents are not all technology-focused, though: there is one article that discusses the early “exploration” of Mars by Giovanni Schiaparelli and Percival Lowell and the origin of the Martian “canals” as well as another article on Orson Welles’ infamous War of the Worlds broadcast. One article toward the end even makes the leap to discussing terraforming Mars into something more Earth-like. The book is a large-format, slick-paper hardcover book with gorgeous photos and illustrations as well as a good visual design, with callout boxes for interesting facts and activity pages scattered throughout the text. In fact, given the number and types of activities, this might be a good book for interested parents and children to read and do projects together. The activities include showing a way to visualize Earth and Mars orbits, comparing Earth and Mars size and density, and building a model Mars habitat. If the projects are not quite at a science fair level of complexity, they are at least things that kids in the targeted range can do on their own using common household items without creating a lot of havoc. Again, given the complexity of their subject, Aldrin and Dyson managed to cover the broad range of topics necessary to show what goes into a Mars settlement: life support, food production, propulsion, electrical power, etc. It’s not too much information—just enough to whet the appetite and get the inquisitive reader to ask more questions. The only two topics I noticed the book did not cover were the presence of superoxides in the Martian regolith and the potentially controversial aspects of finding life on Mars. That might be getting into the weeds a bit. 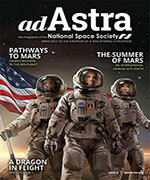 While Aldrin and Dyson are not calling Mars settlement an easy task, they are advocating for the project, after all. I highly recommend this book for its target audience. It’s a great, broad-based introduction to space settlement for an impressionable audience. Whether Mars is the next destination for human exploration remains to be seen. Young people would benefit from reading this type of high-quality book about settling the Solar System’s other destinations. 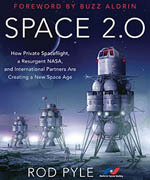 In fact, Dyson already has written similar books regarding living on the Moon and on a space station. I guess she needs to get to work on the asteroids next. I’m looking forward to giving this book to my nephew. My sister will be thrilled with the questions he’ll come up with after he’s done.